This page is about is my paper “MOOCs and the Funnel of Participation”, presented at LAK13, the Third Conference on Learning Analytics and Knowledge, April 2013, Leuven, Belgium. Clow, Doug (2013). 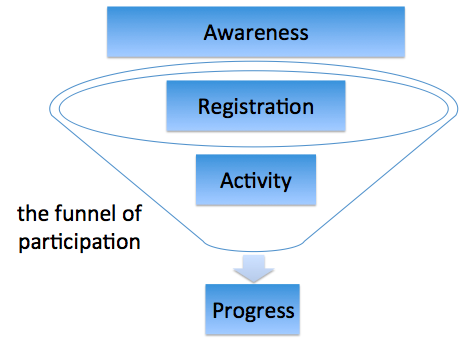 MOOCs and the funnel of participation. In: Third Conference on Learning Analytics and Knowledge (LAK 2013), 8-12 April 2013, Leuven, Belgium, p185-189. New York: ACM. Massive Online Open Courses (MOOCs) are growing substantially in numbers, and also in interest from the educational community. MOOCs offer particular challenges for what is becoming accepted as mainstream practice in learning analytics. Partly for this reason, and partly because of the relative newness of MOOCs as a widespread phenomenon, there is not yet a substantial body of literature on the learning analytics of MOOCs. However, one clear finding is that drop-out/non-completion rates are substantially higher than in more traditional education. This paper explores these issues, and introduces the metaphor of a ‘funnel of participation’ to reconceptualise the steep drop-off in activity, and the pattern of steeply unequal participation, which appear to be characteristic of MOOCs and similar learning environments. Empirical data to support this funnel of participation are presented from three online learning sites: iSpot (observations of nature), Cloudworks (‘a place to share, find and discuss learning and teaching ideas and experiences’), and openED 2.0, a MOOC on business and management that ran between 2010–2012. Implications of the funnel for MOOCs, formal education, and learning analytics practice are discussed. Presentation: Wednesday April 10th, 2013, Track 2 Ap 01.30 AUD. J. MONET, 15:45-17:00 in the ‘MOOCs’ session. How to tell if you have a power law (hint: you probably haven’t): Clauset, A., Shalizi, C.R., Newman, M.E.J. 2009. Power-law distributions in empirical data. SIAM Review 51(4), 661-703. Arxiv full text preprint. iSpot – social networking for learning about natural history: upload a photo of wildlife you’ve seen and get help putting a name to it. My LAK11 paper explores some of the data – and fails to find power laws: Clow, Doug and Makriyannis, Elpida (2011). iSpot Analysed: Participatory Learning and Reputation. In: Proceedings of the 1st International Conference on Learning Analytics and Knowledge, 28 Feb-01 Mar 2011, Banff, Alberta, Canada. Cloudworks – online elearning community hub – “a place to share, find and discuss learning and teaching ideas and experiences”. openED – open, online course on business and management competencies in a Web 2.0 world. Early results and description: Aczel, James; Cross, Simon; Meiszner, Andreas; Hardy, Pascale; McAndrew, Patrick and Clow, Doug (2011). Some issues affecting the sustainability of open learning courses. In: EDEN 2011 Annual Conference: Learning and Sustainability: The New Ecosystem of Innovation and Knowledge, 19-22 June 2011, Dublin, Ireland. Pingback: Heli connecting ideas » Blog Archive » Are there any laws for open participation?